Breakfast is often called the most important meal of the day. In celebration of National Egg Month, scramble up your breakfast routine with these delicious egg recipes. 1. Toast bagel then place cheese and Canadian bacon on the bottom half. 2. Heat oil in a small nonstick skillet over medium-high heat. Add egg, spinach and pepper and cook, stirring, until set, about 1 minute. 3. Place the egg mixture on the cheese and bacon. 4. Top with the remaining bagel half. 5. Cut in half to serve, if desired. 1. 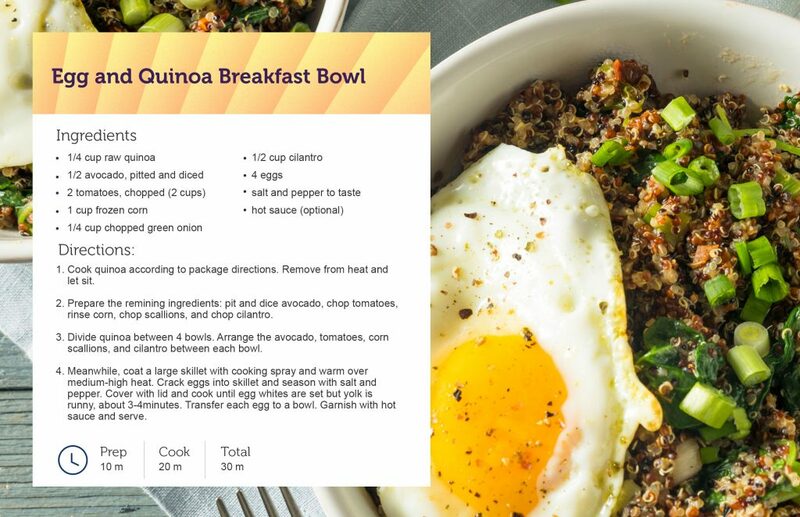 Cook quinoa according to the package directions. Remove from heat and let sit. 2. Prepare the remaining ingredients: pit and dice the avocado half; chop the tomatoes; rinse the canned corn; chop the scallions, and chop the cilantro. 3. Divide quinoa between 4 bowls. Arrange the avocado, tomatoes, corn, scallions, and (optional) cilantro between each bowl. 4. Meanwhile, coat a large nonstick skillet with cooking spray and warm over medium-high heat. Crack each egg into the skillet and season with salt and pepper. Cover with a lid and cook until egg whites are set but yolk is still runny, about 3 to 4 minutes. Use a spatula to carefully transfer each sunny side egg into each bowl. Garnish with hot sause and serve. To help save time, you can substitute hard boiled eggs that you can make in advance. Also, if you are watching your sodium intake, be sure to check the labels of the hot sauce that you are buying as it varies across products. 2. In a medium nonstick pan, warm oil over medium-high heat. Add onions and mushrooms, stirring occasionally and sauteing until soft, about 10 minutes. 3. Meanwhile, warm the turkey sausage according to package directions. Chop into small pieces. When onion and mushroom mixture is cooked, remove from heat and stir in sausage. Using a spoon, divide mixture evenly between each muffin cup. 4. In a small bowl, add egg substitute, skim milk, and pepper. Whisk together with a fork. 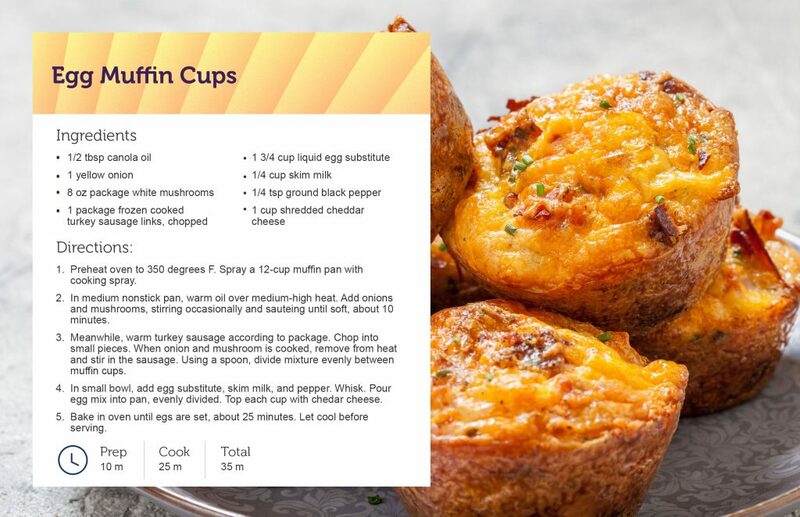 Pour egg mixture into the muffin pan, again evenly dividing mixture into each muffin cup. Top each cup with cheddar cheese. 5. Bake in the preheated oven until eggs are set, about 25 minutes. Remove from oven and let cook slightly. Use a knife to go around the edges of each egg muffin and remove it from pan. Serve. To make this recipe even healthier, use egg whites instead of an egg substitute. These healthy egg breakfast recipes provide you the nutrition needed to start the mornings. Customize them and enjoy them on the go. What recipe do you want to try?